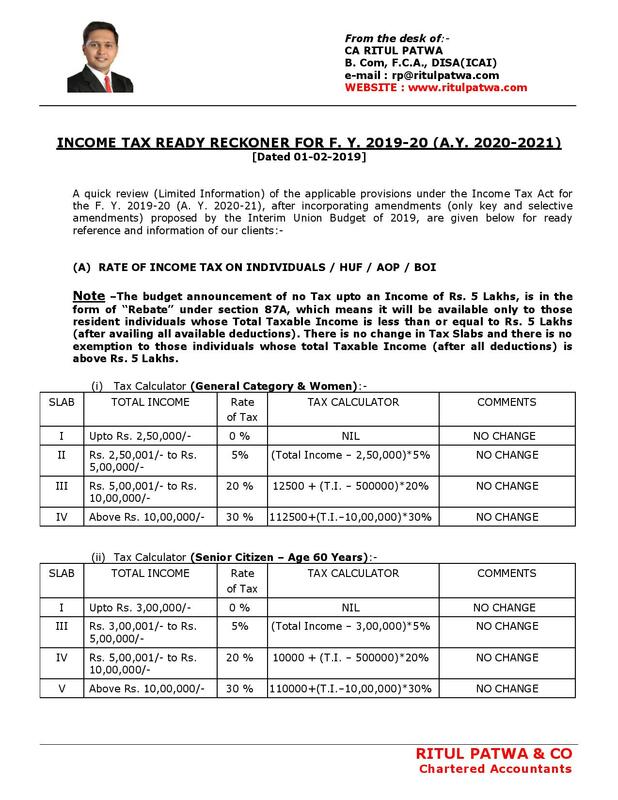 Note –The budget announcement of no Tax upto an Income of Rs. 5 Lakhs, is in the form of “Rebate” under section 87A, which means it will be available only to those resident individuals whose Total Taxable Income is less than or equal to Rs. 5 Lakhs (after availing all available deductions). There is no change in Tax Slabs and there is no exemption to those individuals whose total Taxable Income (after all deductions) is above Rs. 5 Lakhs. 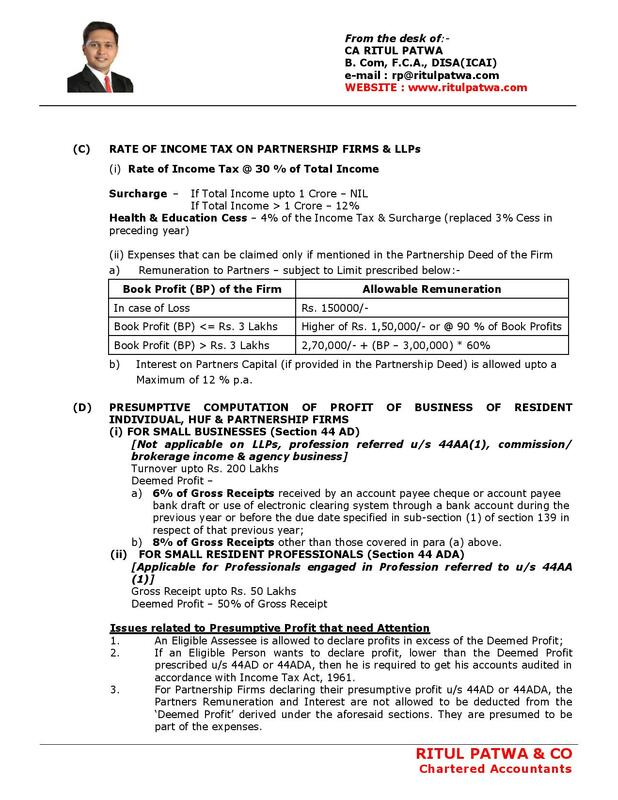 24 (b) Interest on Housing Loan (For Self Occupied Property) Upto Rs. 2 Lakhs In case of Let Out House Property the entire Interest is deductible; however by virtue of Section 71 (3A), the maximum loss of only upto Rs. 2 Lakhs can be set-off against income from other head of incomes and excess if any shall be carried forward for set-off in succeeding 8 years. 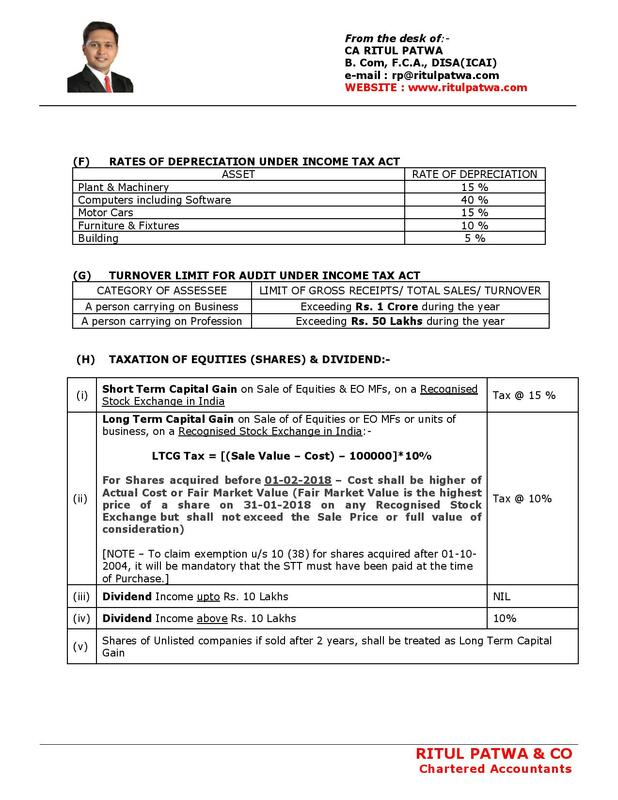 a) Capital Gain upto Rs. 2 Crores Amount of CG invested in Purchase or Construction of upto 2 Residential Houses - Till F. Y. 2018-19, the exemption was limited for only 1 Residential House;- This benefit can be availed only once in a Lifetime by an assessee. 80 GG Rent Paid Lower of Following:1. Rs. 5000 p.m.
80TTA Interest from Savings Account Rs. 10000/- This is allowed to the extent of Interest earned from Savings Account. 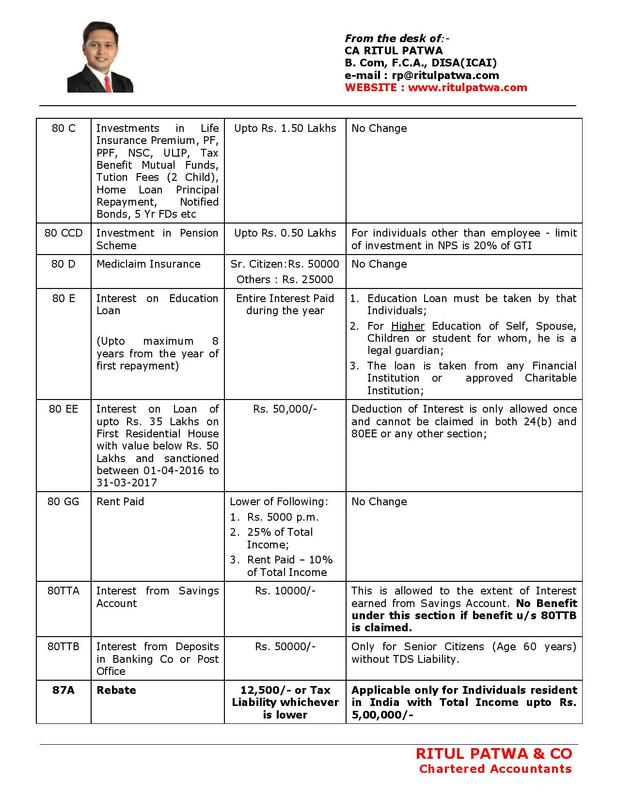 No Benefit under this section if benefit u/s 80TTB is claimed. 80TTB Interest from Deposits in Banking Co or Post Office Rs. 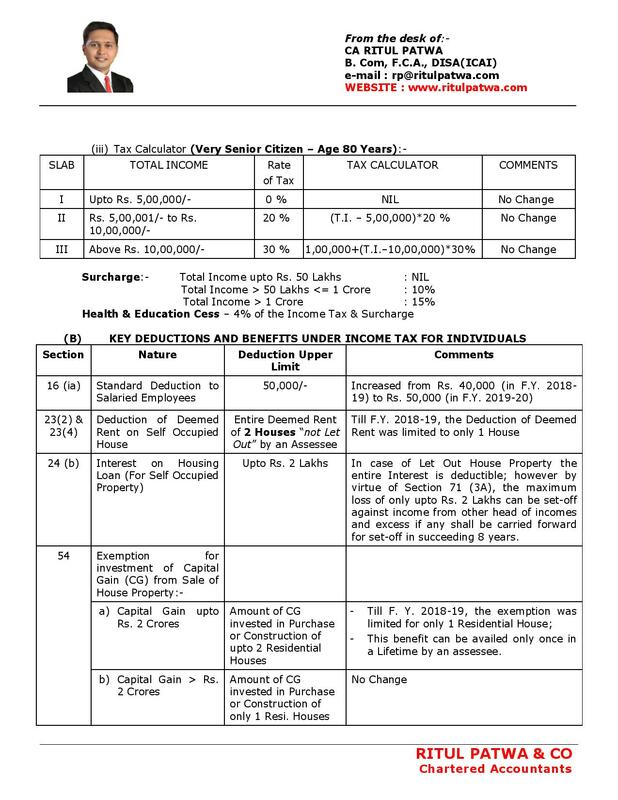 50000/- Only for Senior Citizens (Age 60 years) without TDS Liability. Maximum of 12 % p.a. 8% of Gross Receipts other than those covered in para (a) above. If an Eligible Person wants to declare profit, lower than the Deemed Profit prescribed u/s 44AD or 44ADA, then he is required to get his accounts audited in accordance with Income Tax Act, 1961. 3. For Partnership Firms declaring their presumptive profit u/s 44AD or 44ADA, the Partners Remuneration and Interest are not allowed to be deducted from the ‘Deemed Profit’ derived under the aforesaid sections. They are presumed to be part of the expenses. 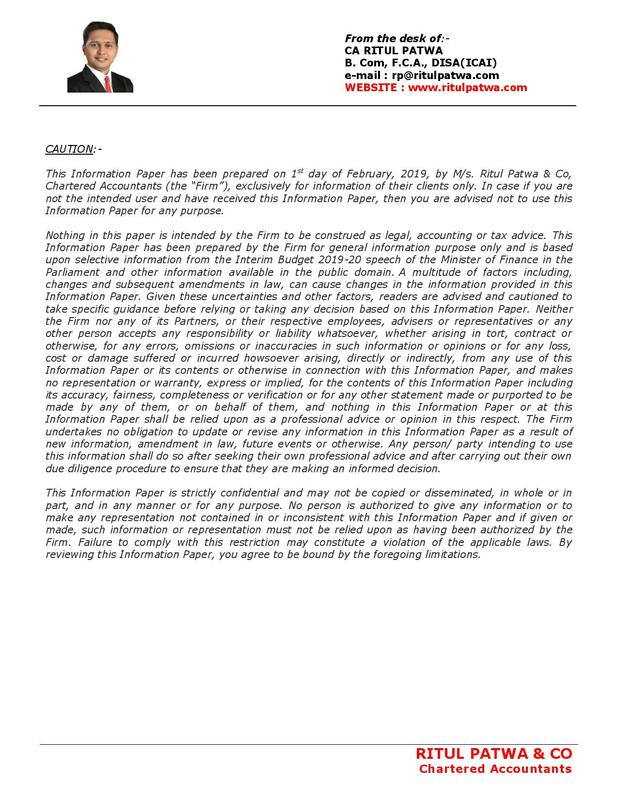 Exemption from the compliance burden of maintaining books of accounts. Exempted from advance tax and allowed to pay their entire tax liability before the due date of filling the return or actual date of filing their return whichever is earlier. (i) Minimum Alternate Tax (M.A.T.) - Applicable where the Book Profits are more than Profits as per Income Tax Act, 1961. (a) The rate of MAT payable by a company is 50% u/s 115 JB. (b) The period allowed to carry forward the tax credit under MAT is further extended to 15 (Fifteen) years. 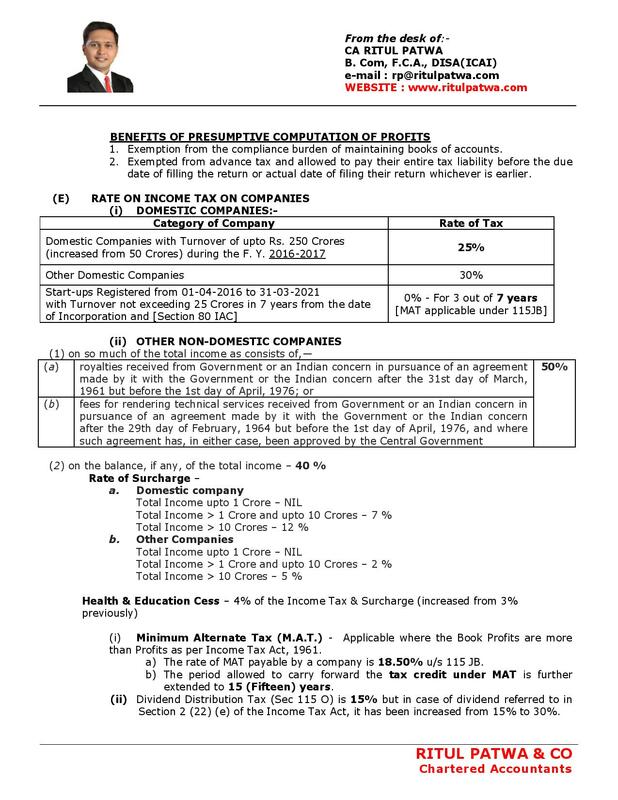 (ii) Dividend Distribution Tax (Sec 115 O) is 15% but in case of dividend referred to in Section 2 (22) (e) of the Income Tax Act, it has been increased from 15% to 30%. CAPITAL – Payment for Fixed Assets Purchase 43 10000/- per day per asset The expenditure shall not be included in the cost of asset. No Depreciation benefit. Payment of Expenses on Specified Business 35AD 10000/- per day per asset No deduction shall be allowed in respect of such expenditure. Payment of Business Expenses 40 A (3) 10000/- per day to a person No deduction shall be allowed in respect of such expenditure. Payment made for plying, hiring or leasing goods carriages Second Proviso to 40 A (3A) 35000/- per day to a person No deduction shall be allowed in respect of such expenditure. 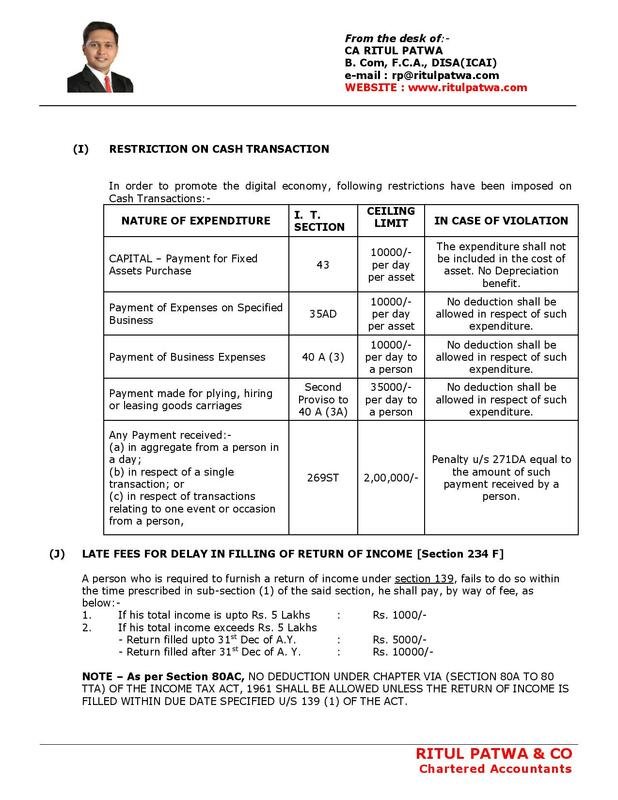 (c) in respect of transactions relating to one event or occasion from a person, 269ST 2,00,000/- Penalty u/s 271DA equal to the amount of such payment received by a person. NOTE – As per Section 80AC, NO DEDUCTION UNDER CHAPTER VIA (SECTION 80A TO 80 TTA) OF THE INCOME TAX ACT, 1961 SHALL BE ALLOWED UNLESS THE RETURN OF INCOME IS FILLED WITHIN DUE DATE SPECIFIED U/S 139 (1) OF THE ACT.